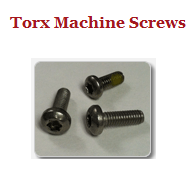 Torx machine screws are popular largely because of their ease of use. 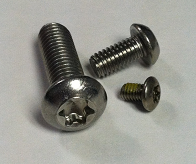 The shape and increased contact between the driver and the screw means you can use more torque both when you install them and when you remove them.Unlike the ‘cam out’ you often find with Phillips® and cross recessed screws, where the driver rises in the recess causing movement of the material and resulting in a deformed recess or cone shaped hole, the Torx machine screw results in no deformation of either the recess or the hole. Torx machine screws come in many styles. The most common are Pan Head, Flat Head and Button Head. The Torx Drive Thread Forming screws, used in both plastic and metal materials are becoming more popular because their drive characteristics mean ease of use with no damage to the material. Recently, the International Standards Organization (ISO) has adopted and published the TX Drive, Torx Alternative as a viable alternative to Licensed Torx. This means a huge increase in the number of manufacturers that can use Torx machine screws. We are specialists in the metric fastener industry with a reputation of providing some of the highest quality Torx screws you’ll find anywhere. Our technical experience and expertise means we can help you with your fastening needs. Our mission is to be the creative problem solvers for our customers, while providing the best possible quality, service and reliability at advantageous pricing. Contact us to discuss how we can help you use the amazing Torx machine screws of House of Metrics in an effective and economic way.